It was really fun to work with metallic fabrics. My biggest question was how they would react to my iron and quilting. I'm happy to report that I had no problem with either! Jennifer's designs and colors are also so sophisticated. I'm very pleased with how this quilt turned out. 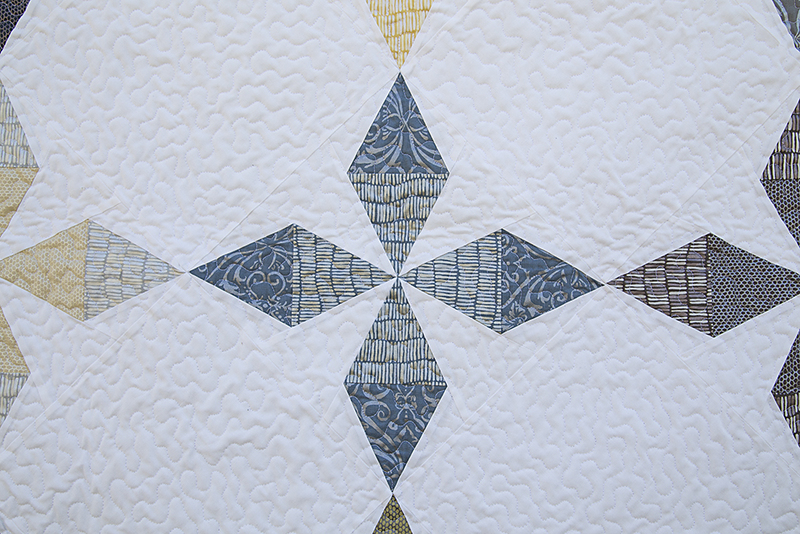 This quilt is based off the Arkansas Traveler quilt block. You guys probably know I love that block by now! (If not, see here...here...AND here. lol) You can find the pattern for this block on Lee's blog. I made a few changes to the block. Rather than piece the center focus of the block with 4 diamonds, I used 2 triangles. I actually drew those into the paper piecing pattern and treated those as pieces 1 and 2. I also placed the blocks on point. I love that rotating a block 45 degrees creates a completely different look. When I first designed this quilt, I was going to make the entire background white. But after I laid out the blocks, I decided to use the beautiful Shimmer prints for the border background half square triangles. I am so happy I made that change, because it really adds the wow factor that this quilt needed. And be sure to keep up with the blog hop for more inspiration and chances to win charm packs. Jennifer will also be giving away a full fat-quarter bundle at the end of the party! The winner is #170 - Janet S.! Congratulations Janet - I will pass along your email to Robert Kaufman fabrics. They will be in touch to ship your prize.